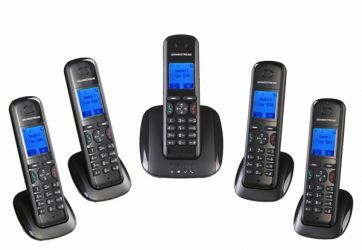 Grandstream currently offers two main series of enterprise grade IP phones. In addition to IP telephony solutions, they also offer a wide selection of IP surveillance solutions. There are twelve different models offered in this series. These are the GXP110x, GXP116x, GXP140x, GXP1450, GXP2100, GXP2120, GXP2124, GXP2200, GXP2130, GXP2140, and GXP2160. The lines that are available on each model range from only one line on the lower end GXP110x and GXP116x models, all the way up to six lines on the higher end GXP2120 and GXP2200 models. The GXP2200 is also the only model that has a color display and can support Ethernet speeds up to 1000 Mbps. This model also runs on the Android operation system. To compare GXP series phones in detail, please review their Comparison Chart. You can read our review of the GXP2130 here. Grandstream has an innovative wireless solution that addresses the needs of slightly more mobile workers. The Grandstream DP715 and DP710 wireless IP phones allow users to roam up to 150 feet away from a central base-station when inside a building, while up to 1000 feet is possible if in an open space or outside. The DP715 model primarily comprises of a handset and a main base-station that enables a connection to the internal network via an Ethernet cable. The DP710 model is the same handset (with charging base) and will sync to the main base-station allowing up to 5 extensions to be located in and around a central office location. Read our review of the Grandstream DP715 for more detailed information, specifications and our overall recommendation. There are currently three different models of video phone offered. These are the GXP300X (7" color, touch screen display), GXV3175 (4.3" color LCD display) and the GXV3140 (5.6" color, tiltable, LCD display) video/multimedia phones. For more details visit their video telephony section. We test all the VoIP Phones we use extensively. We have used the Grandstream GXP280 as our simplest SIP Phone for some time. It has worked flawlessly and consistently.